Girl Fight is the latest release from developer Kung Fu Factory, who are certainly experienced in making fighting games, after previous work on the Wii version of Mortal Kombat: Armageddon, and 2011’s Supremacy MMA. Do they now know enough to create a smash hit for XBLA and PSN? There is nothing subtle about Girl Fight. The name gives away the entire premise, which is simply women beating each other up. Unsurprisingly, they do it all whilst wearing fairly limited clothing, with an unlockable picture of them in a suggestive pose waiting for you if you finish the game with them. There’s a choice of 8 brawlers to select from, (or at least there is once they’ve been tediously unlocked one at a time by completing the main arcade mode), most of which fit into one of many stereotypes, such as the war hero, the samurai, the cyborg, and the psychopathic murderer. There isn’t really much to differentiate between any of them besides their look. Unlike most fighting games, every character feels the same, there aren’t any slow but hard hitters, no one really has any special powers. If you can use one character, you can use any of the other 7. There’s no diversity. One way in which the game tries to make fights different is through the use of so called “psi amps”. These are special temporary powers that the characters can use after they’ve landed a few blows on their opponent, granting abilities like life steal, improved attack or defence, or being able to stun the enemy for a couple of seconds. These aren’t unique to characters however so whoever you use, you get the same abilities. You get to choose 2 from a list before the fight, but the original selection is minimal, and the others require purchase from the in-game store to unlock. To do so, you need to earn Combits (the in game currency) from fights, which is very easy to do, and are accumulated fairly rapidly simply by playing the game. In fairness, the fights themselves can be quite fun. The combat is quite fast and fluid, helped by the lack of any slow fighters. The controls are very simple, with one button to punch, another to kick, and another to block. This greatly restricts the possible move list, and none of the moves really stand out. The variety of game modes is also lacking; there are no unique modes, instead you get the bare minimum. There’s a very short arcade mode consisting of a set of 8 fights, completing which will unlock the next character to play with. At the beginning you only have one playable fighter, so doing this is a must. As well as local multiplayer modes, there is online functionality, but it's basically obsolete as the online community seems nonexistent. The story is mostly absent, with each character having a few bits of history that can be purchased with points to fill in a bit of back-story if desired, and a couple of badly delivered pre-fight lines from a dreary computerised voice hinting at the reason behind the tournament. Unfortunately, bar the background music, this is really the only interesting audio in the game as none of the characters have voices that stretch beyond grunts and squeaks. Revealing costumes and ridiculous breast physics are on the menu! Graphically, the game does well. Arenas are all varied, with interesting goings-on in the scenery. Each area does however limit you to an empty circle in the middle of all this, with no environmental interaction available. The characters, however poorly attired, are well designed, but it would have been nice to see growing amounts of battle scars, rather than the relatively pointless Dead or Alive-like breast physics. 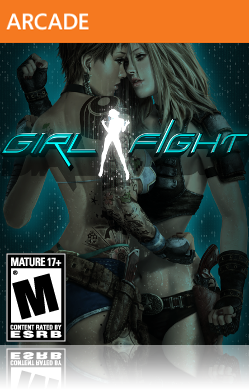 Girl Fight may not be the worst fighting game around, but for the price, there are better out there. The single player is brief and uninspired, and the online is barren, so it can only really be recommended for local multiplayer. Yes, the fights can be entertaining, but they get so samey, it gets boring fast.